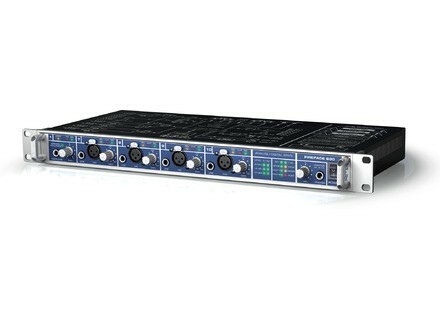 Fireface 800, FireWire audio interface from RME Audio in the Fireface series. The Fireface 800 is a very powerful firewire interface, one of the reasons I chose to use it is because it has the fast technology for a firewire interface. It has real time sample rate lock and sample rat control during playback and recording. Most interface don’t have all of those features either, they mainly have one or the other. Also, I used it on a windows computer for service pack 2 and it worked great because they created an upgrade which fixed some of the lagging and not syncing problems. 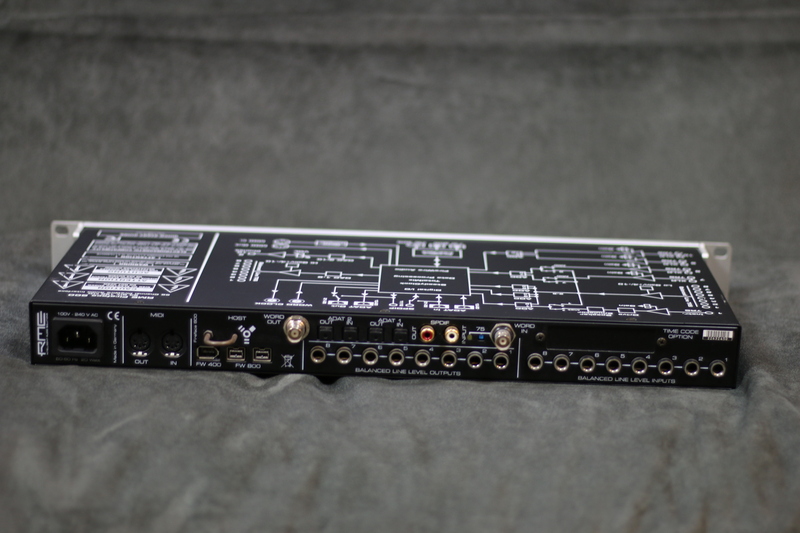 The FireFace 800 has eight line inputs and outputs which was just enough for what we needed to use it for at the time. We used 7 of them though which left one open for something maybe we wanted to add on later down the road but at the time we only needed 7. Another great feature is the Steady clock technology. You can synch reference everything for the whole studio and session with it, I havent had another interface that could do that so it was big for me to be able to do that on this. It includes a midi option as well for those who use a lot of midi set ups. There are other versions of the FireFace like the 400 mode which is a step down from the 800 if you are really arent in need of all the inputs and it can basically do the same thing as the Fireface 800 and its cheaper so check that one out if you don’t need this much inputs and outputs. Actually the 400 might be a better fit for a home studio that the 800 is because at home you really don’t have the need for that many ins and outs. But all in all the FireFace 800 is one of the best firewire interfaces out. A completely professional grade interface. I track live instruments with Neumann M149 tube, AEA R84, RE20, Rode and modified Shure SM 57s , all in a real studio through high end tube pres and 1950s vintage mic pres etc... This interface has phenomenal sound quality even at 44.1. The multiple connections allow me to connect a Lexicon hardware digitally via SPDIF. I also use all my vintage tube gear - not only to track- but to mix as well in Logic pro in the same way as you use plugins..except they are the real thing! and with the same flexibility as a plugin. So if you desire to be able to use all your analog gear to mix in the box alongside your plugins simultaneously, this interface makes it happen and Logic pro 9 is set up for it, so it is very easy. The clock is so good it has become the master clock in the studio. Clocking makes an audible difference in terms of audible phase shift harshness. I have not yet used the mic pres, as I have plenty of amazing vintage ones by Altec, UA, UREI, and a Buzzaudio MA2.2. The headphone monitor volume is very powerful and clean. The overall sound -if coupled with Logic pro 9- approximates the sweetness of 30 ips Ampex tape in general character and vibe (at 44.1). At higher rates it becomes more" Hollywood soundtrack" in detail level and vivid transient response as well as dynamic range perception. getting started was simple, it actually suprised me with how easy it was. Overall, I am shure it will sound very different depending on what DAW you have ( protools, nuendo, cubase all have their own sound character due to differing algorithms and design priorities. But the great news is it's superb -smooth non ear-fatiguing- performance at CD quality 44.1. I hope this gives an idea of how this unit performs in strictly professional circumstances (the studio has a IT 20 series II Furman balanced power supply conditioning) for very long hours at a time. 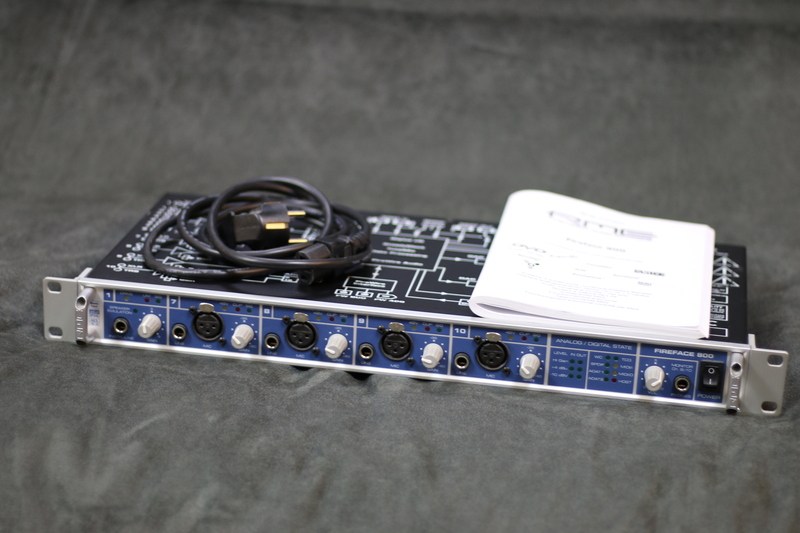 songboy's review"Best Interface I have ever heard/seen/used"
The main thing that motivated my choice was the High quality preamps, the amazing ad/da converters and the fact that it had both firewire 400 and 800 ports on it. I am currently using a macbook laptop but intend to upgrade to a Mac Pro desktop and having both the firewire 400 and 800 was a must. I use the Fireface 800 to handle all of my instrumentation. I run ableton live 8 with the fireface and I run everything (vocals, guitars, bass, Rhodes piano, synths, computer based synths/effects and outboard effects through effects loops) through the computer, through live in order to loop all audio at my bidding. As for connection types, you get it all; 4 XLR's, 8 analog in/outs, two adats, 1 firewire 400, 2 firewire 800's, word clock in/out, spdif in/out. I run this all on a macbook (2.2ghz 4gb ram, 320hdd). I have not had the unit long enough to update again but the unit has been out for a few years and has been updated regularly. I can very easily use all of my inputs and tons of computer synths/effects and loop it all with the looper and set the buffer so it runs with less than 8 milliseconds of latency. Its quite remarkable especially compared to my former unit the Presonus Firebox. The drivers are extremely stable, as to be expected from RME. I use this mainly with ableton 8 but I also use it often with Logic 9. The most amount of tracks I have tried to record simultaneously is 8 and it performed perfectly. xpected from RME. I use this mainly with ableton 8 but I also use it often with Logic 9. The most amount of tracks I have tried to record simultaneously is 8 and it performed perfectly. I have had no compatibility issues so far. The manual that came with the fireface is fairly indepth and I highly suggest reading cover to cover if you want to get the most out of this unit. It is a very well written manual and is more than sufficient. I guess I could say the general setup is simple, but this unit can do so much. If you want to use all its amazing options, then you better be ready to do your homework. Yes, the typical functions are accessible via the front of the unit and the software mixer/control panel that automatically loads on the computer when you connect via firewire. What I love most about this unit is the pristine ad/da converters. I run my analog instruments (guitar/bass/rhodes/synths) into a Mackie Vlz3 mixer with the output going to a Fender Twin Reverb amp and a Peavey TNT 150 bass amp. I use the Alt Outputs on the mixer to send a "loop" to the RME then back into the mackie so I can "Loop" the instruments in Ableton 8. When I did this with the presonus, there was a little latency and the audio quality was significantly altered. 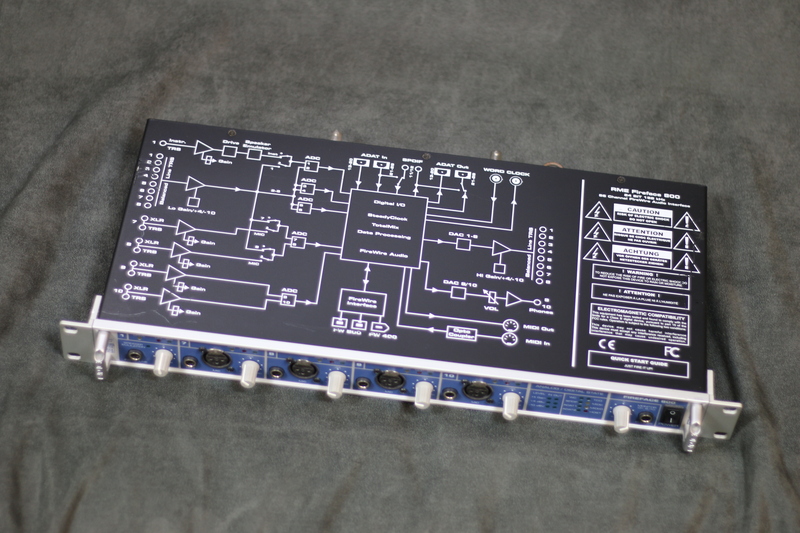 With the the Fireface, the difference between the straight analog pathway and the computer pathway are virtually indistinguishable. I have even thought about getting rid of the Mackie and just running everything direct with the RME, its that good!!!! New these go for $1700 but I got mine used for $1250. Its a lot of money, no doubt, but if you want this kind of quality, you have to pay, and its worth every last penny. 10 out of 10 for sound quality (I'd give it an 11 if I could). I have used a Presonus Firebox, Firepod, Alesis Multimix, and a MOTU 828 mk2 and this blows them all out of the water. I would definitely make the same choice again. I highly recommend this unit. Anonymous 's review (This content has been automatically translated from French)" 9/10"
RME released new drivers for Apple’s latest operating system, Snow Leopard (Mac OS X 10.6), available on the company’s website.